First off I need to get a short message out of the way. It appears that yesterday (Sunday), my home team (Saskatchewan Roughriders) won the Western Semi-Final in the Canadian Football League and have moved on to the Grey Cup next Sunday in Edmonton. I expect to see Commonwealth Stadium packed with green and white. Don't let me down Rider fans. Don't let me down. 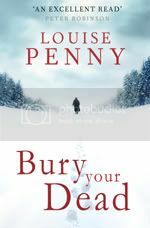 This weekend, I read a fantastic book from a Canadian author - http://www.louisepenny.com/. She writes a mystery series based in Quebec and it's absolutely fantastic. "This sixth Gamache mystery is set partly in the tiny fictional (and oddly murderous) village of Three Pines, in Quebec’s Eastern Townships. But most of the action takes place in Quebec City. A vibrant, sophisticated fortress city, which lives in the present but guards its past. For that’s the other location of this novel. The past. It's February and bitterly cold in Quebec City. But Chief Inspector Gamache barely notices. He's nearly consumed with grief and guilt over a police action he led - and the mistakes he made. He spends his time with his now-retired mentor, and in the peaceful library of the Literary and Historical Society. A bastien of the dwindling English population. But if Gamache thought death was finished with him, he was wrong. The body of a celebrated eccentric is found in the Lit and His, and Gamache is drawn again into hunting a murderer. The victim is an amateur archeologist who was monomaniacal in his pursuit. He had spent his life trying to find the body of Samuel de Champlain. This is the great mystery that has haunted Quebec for centuries. The founder of Quebec died 400 years ago. And while the burial places of nuns and farmers and minor functionaries of the time are known, no one knows what became of the Father of Quebec. As Chief Inspector Gamache digs through the crime and the venerable old city it becomes clear the murder is rooted in this 400 year old mystery, and in people long dead. But perhaps not buried. It also becomes clear to the Chief Inspector that to find the truth he needs to confront his own ghosts, and bury his own dead. "